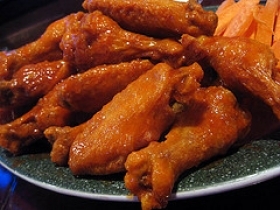 Have you made BUFFALO CHICKEN WINGS #2? 1. 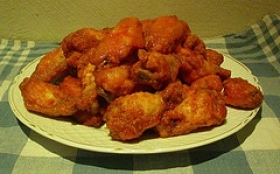 Fry up the chicken wings that have had the tips removed and cut in half at the joint in 1/4 cup of butter until golden brown. 2. 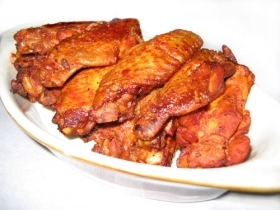 Allow the wings to cool before frying a second time, yes they are fried a second time so if you are a calorie watcher you can stop now. 3. They can be fried the first time a day ahead. 4. 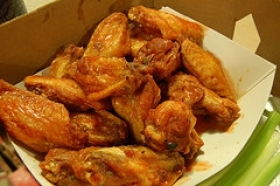 Before frying the second time mix the Tabasco and Hot Pepper sauce with the melted butter. 5. 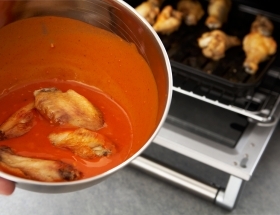 Fry the wings a second time in the HOT butter until wings are heated. 6. You need to use enough Tabasco and Hot Pepper sauce to give the butter a reddish color. 7. 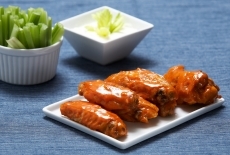 Serve with chilled celery sticks and blue cheese dressing. 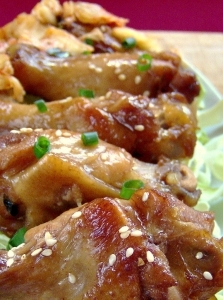 This recipe contains potential food allergens and will effect people with Butter, MSG, Poultry allergies.